Use to make precision measurements of your Heli Rotor blades angle of incidence. This precision laser cut kit produces a sensitive pitch gauge with wide range. 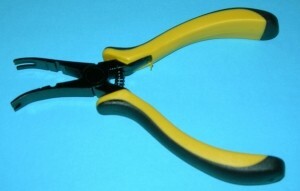 Rubber band provides spring action to pull blade clamps in. Simply squeezing together triggers adusts self centering blade clamps to a wide range from 400 to 60 size heli's. Refer to your heli's setup manual for exact reccomended settings. Shown on .30 size woodies. Notched on sides for rubber band to retain needle for transport. Quick build kit requires only about 5 minutes of your time turning an Allen wrench to complete. Saves hours of guessing and head scratching later. Complete with quality socket head fasteners, made from aircraft grade plywood. Flybar must be leveled prior to taking reading. Easily install and pop open ball links without damage. 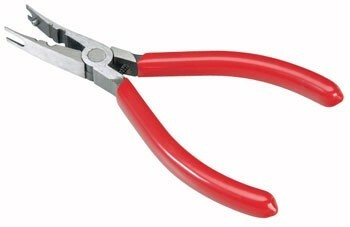 Multi-function ball link pliers for installing or removing small ball link ends. Also aids in holding parts steady while making adjustments. 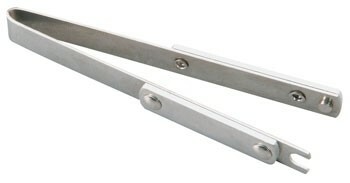 Multi-function ball link pliers for installing or removing ball link ends. Also aids in holding parts steady while making adjustments. 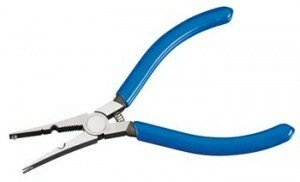 Multi function ball link pliers for installing or removing ball link ends. Also aids in holding parts steady while making adjustments.